The Datebase includes the more than 900 operational satellites currently in orbit around Earth, with 24 types of data for each satellite. These include technical information about each satellite (mass, power, launch date, expected lifetime) and its orbit (apogee, perigee, inclination, and period), as well as what the satellite is used for, and who owns, operates, and built the satellite. The information in the Database is drawn from open sources and is updated quarterly. It’s available either in Excel format, or the information can be pulled into the user’s database. The Database is intended as a research tool with information in a format that can be easily manipulated for research and analysis. Users can find information about a particular satellite; identify sets of satellites having a common characteristic, such as altitude or mission; and sort or aggregate data about the whole population of satellites. Below are some examples. 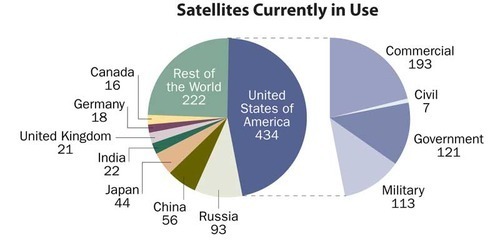 The new version of the Database lists 943 operating satellites as of July 1, 2010, with the United States owning roughly half of those, and Russia and China owning 10% and 6%, respectively. Since 2007, Colombia, Vietnam, Venezuela, Turkey, and Switzerland have had their own first satellites launched. While there are more satellites in low Earth orbits (LEO, with altitudes less than 2,000 km) than geosynchronous orbits (GEO, 36,000 km), there are roughly twice as many commercial satellites in GEO as there are in LEO. In LEO, the government is the largest investor, but commercial investors own two-thirds of GEO satellites. Medium Earth orbit (MEO) satellites include the GPS navigational satellites, which orbit at altitudes of about 20,000 km. Satellites on elliptical orbits have parts of their orbit in more than one of these regions.